We all know people who are chronic complainers. They spend inordinate amounts of time, each day, bending the ears of anyone who will listen, going into great detail about what is wrong with other people, policies or departments. And, because like attracts like, unless you have done a good job of nipping in the bud, this 'below-the-line' type behavior - they never seem to run out of others who will listen, share and commiserate with them... which only lends fuel to their fire. The problem with chronic complainers, is that they are quick to point out what is wrong, but slow to be part of the solution. 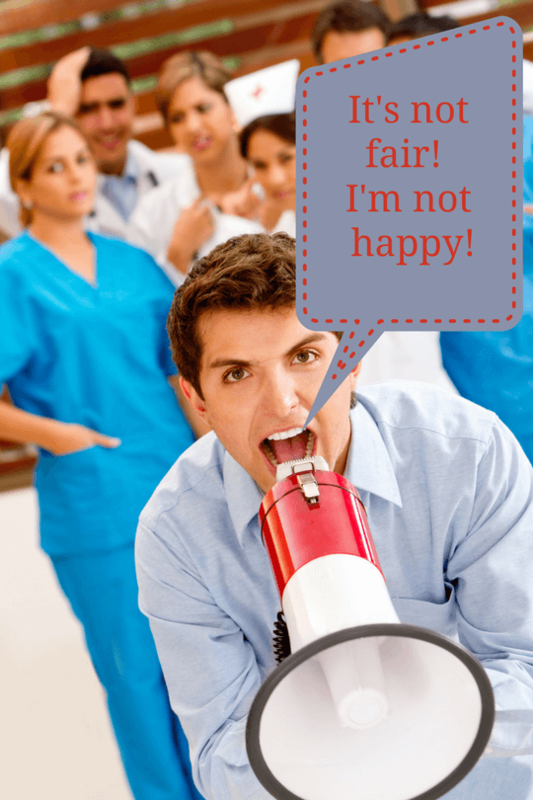 Most complainers, don't realize that their complaint is a negative way, of requesting what they do want. A complaint like, 'We aren't appreciated around here', is really a cry for attention. A cry that they want to feel important enough to be noticed. 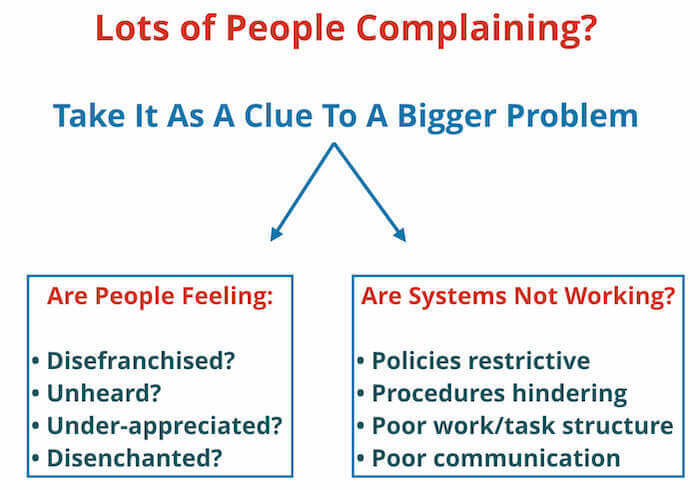 If you have a lot of people in your team complaining, take that as a clue, that maybe there is a bigger problem. Maybe your People System and your Work Processes needs reviewing. Maybe people are feeling dis-enfranchised, unheard. Or maybe, the systems, policies and procedures, you have in place, are hindering them (or making it more difficult than it needs to be) from successfully completing their work. However, if it is only the odd one or two people who seem to be complaining a lot (and your fairly confident that mostly your People and Work Processes are in good shape) then these tips may well help you get them focused on being part of the solution, not part of the problem. To successfully stop complainers, see yourself as a 'Discoverer of the Truth' and help those who are complaining to do the same. Chronic complainers tend to generalize and make vague statements, and they often times haven't actually got to the bottom of why they are so frustrated. As their leader, you are responsible for drawing out from them what specifically it is they want. By asking good questions, you can often discover what it is they are really thinking, and hopefully get them to have an 'aha' moment, and to consider fully their reason for complaining, and then shift them into focusing on the solution they want. "Which market? By what measure is it the worst - on price, battery life, speed, customer service or what? " In universal generalizations people tend to use words like always, never, every, all, everyone etc. For example: "We never get our quality right". It is most unusual for anything to be never right, or always right, or always wrong etc. You want to ask the person if their generalization really is universally applicable, "Are you sure we have never got our quality right, not ever once?" By doing this you help them to break their complaint down, to something more specific and manageable. You can the start them focusing on what actual events causes the quality to be off standard and start fixing the problem. You've probably heard it before, "That's the ways we've always done it". Here, the person is quoting an unspecified rule, for which there isn't any great justification. "What other ways could it be done?" "What would happen if you did it another way?" "What in particular do you think has started going down hill?" "Who else thinks this way?" On what basis are you comparing this to?" If you aren't careful, it can be easy to come across as an interrogator. So you may want to soften the questions a little. For example, In the last example above, you could soften your question to something like, "It's interesting that you say that. I'm wondering, what in particular do you think has started going down hill?" It's your intent to discover the truth of what is going on for this person. Not make them clam up and resent you. As you ask the complainer to get more specific, they will either stop complaining (at least to you) or, more hopefully, they will start to become more solutions focused. Because you are a leader, your tone and way of approaching their complaint, can influence to a great degree, whether their complaints go underground, or the individual(s) begins the process of feeling empowered enough to join with you, and turn themselves into a solution finder who is operating above-the-line. Of course, there are times when there is no solution to a complaint, for example, "I hate winter... it's so cold!" There isn't a way to change the weather. Sure, you can explore the possibilities, but not everyone can move to the Gold Coast, Australia (hmmmm, wonder who lives there???) or Florida. In this type of scenario, (where something truly is impossible to change), you want to get the person complaining, to agree there is no viable solution to this particular issue, and ask that they stop complaining about it, and to turn their attention to the things they can do to lessen the problem. So, if you've got complaining going on, add questions like these to your tool bag and remember, you want to inspire the person(s) to discover the truth and become solution-focused. What would happen if you did it another way? Who do you think can help you with that? Always? Never? Have to? Must? Are you sure it has 'never' ....? What other ways could it be done?